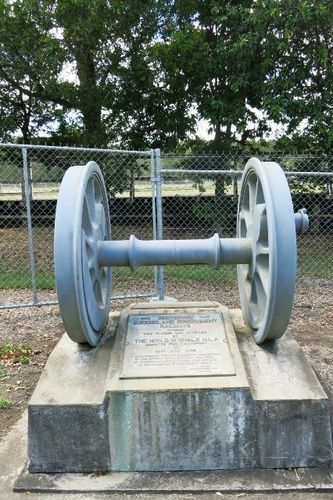 A plaque commemorates the 100th anniversary of the official opening in July 1865 of Queensland's first railway from Ipswich to Grandchester, which was then know as Bigge`s Camp. On 31 July 1865, Queensland's first railway line (the first narrow gauge main line in the world) was completed with the opening of this little station at Grandchester, west of Ipswich. The building was also the residence of the station master. This was the initial stage of the rail line between Ipswich and the Darling Downs that was constructed to allow livestock and produce from the rich Downs region to get to a port for export to other parts of Australia and overseas. The ceremony of turning the first sod for the construction of the railway had been performed by Lady Bowen, the wife of the governor, on 25 February 1864. That means that the construction of the 35 km of rail took just under 18 months.